Don't give in to your foam mat phobia! Adding yoga to your workout regimen can help increase your flexibility and overall health. Learn the yoga jargon, choose a style, and you'll be ready for the studio. Yoga is all the rage, and for good reason. Anyone who has seen a little old lady wrap her feet around her head cannot help but feel a little impressed. You might be ready to join the fun, but you're also feeling a little intimidated. Do I have to wear yoga pants? Is the instructor going to make me do a headstand on the first day? What the heck does "namaste" mean? Don't worry, you don't have to be a hard-core yogi to unroll your mat and hit a pose. Men, women, pro athletes, and nine-to-fivers alike have all hopped on the yoga bandwagon. The variety of styles allows beginners, gurus, and everyone in between to benefit from this ancient practice. Although each style of yoga is similar in its goal to help you increase your range of motion, body awareness, and mental health, they all differ in their approach. If you're not sure which style is best for you, here's some help. Try one or try them all, but just try! Hatha yoga is an umbrella term that refers to a number of different branches all geared toward prepping the body for meditation. It focuses on calming the mind, reduces muscular stress and tension, and creates greater mind-body balance. 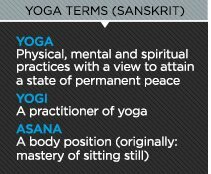 Because all yoga styles are derived from Hatha, it's great for beginners. The pace is slower, and the focus is on breathing and learning new poses. Intermediate to advanced practitioners can also benefit from the challenge of perfecting their poses and holding them for longer. If you do intense workout sessions on a regular basis, some Hatha yoga might be a great addition to your regimen. Relax, increase your flexibility, and learn some new skills. Are you looking to drop a couple lifting days in exchange for something new? One of the most intensive yoga variations, Ashtanga, could replace a few of your strength training sessions—if you're up to the challenge. This variation is made up of a series of six different pose sequences. Yogis move between them relatively quickly. The quick transitions and particular breathing technique will challenge your cardiovascular fitness. Unlike other, more relaxing styles, this series leave you feeling like you just got a great workout. If you're trying to lose weight, Ashtanga Vinyasa yoga would be a great choice. Turn up the heat and fill up your water bottle for Bikram yoga. This type, often referred to as "hot" yoga, is practiced in studio at 40.6 degrees Celsius or 105 degrees F— that's hot! During the 90-minute class, yogis do 26 movements and two breathing exercises. You torch calories and get your sweat on. Bikram practitioners enjoy the heat because higher temperatures make muscles more limber and pliable, enabling a deeper stretch. The heat also helps detoxify your body through perspiration—you'll discover sweat glands you didn't even know you had! If you choose Bikram, be ready for an intense, fitness-building experience. Aches and pains? Iyengar, also known as restorative yoga, emphasizes healing and realignment through supportive postures and sequences. This variation uses a number of props, such as wooden gadgets, belts, and ropes to add variety and movement precision. Iyengar borrows from Ashtanga and combines them to create different groups of asanas, or movements. Aside from the variety, this style of yoga is also great for people who are recovering from an injury. The props allow for greater control in the movements and less stress on the muscles. Meant to restore the mind and body, Iyengar yoga is great for the newbies and advanced practitioners alike. In the West, power yoga is a fitness-based approach to Vinyasa-style yoga. It closely follows the intensity of the Ashtanga method, but is much less meditative than traditional styles. Most neighborhood gyms offer classes in power yoga, which set the yoga trend ablaze. Power yoga focuses on strength, so it's ideal for those looking to increase muscle development. You'll also increase your metabolic rate and get that coveted post-workout calorie burn. Although it's no substitute for weight training, add it to your regimen for a fresh flavor. It's also great for those who can't access a gym or who can't train with weights due to an injury. For people with high daily stress or chronic pain, this variant is ideal. It focuses on lengthening connective tissue through relaxation rather than building muscular strength. This style encourages joints to reach full flexion and extension, which alleviates muscular tightness and joint pain. If you're plagued with tightness or chronic injuries, Yin is the Yang to your weightlifting routine. This variation also emphasises reaching a meditative state. You'll be holding poses anywhere from 5-20 minutes. The long poses, though relaxing, may not be well-suited for the beginner or the faint of heart. Just as the name suggests, prenatal yoga is for mommies-to-be. This style of yoga adapts traditional, Hatha poses to be gentler and less stressful for both the developing baby and the mother. It is recommended that pregnant women get 30 minutes or more of moderate exercise per day, unless they're under particular medical restrictions. Physical activity not only keeps mom healthy, but can improve her posture, decrease pregnancy discomfort like back pain and fatigue, relieve stress, and develop stamina needed for labor and delivery. Practicing yoga is a great option for daily activity, especially if you want an alternative to strength or aerobic training.